Home > Blog > Have some fun yourself! This post for parents stretches back three weeks ago when I started this Tips and Advice series about what you can do to alleviate your concern for your child’s upcoming summer camp stay— ‘childsickness’, as summer camp experts Chris Thurber and Jon Malinowski coin the term in their book, ‘The Summer Camp Handbook’. Thurber and Malinowski mention a number of things you can do to ease your thoughts about missing your kid. So far, I’ve given you five pieces of advice; I revealed three tips in the first post of this series and the other two in the second post. 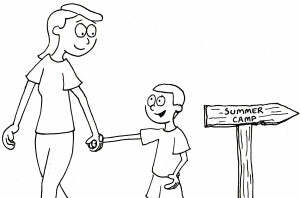 Today, I offer the last two pointers mentioned in Thurber and Malinowski’s camp book about easing the separation for parents and kids during summer camp. It’s important to have plans when your kid is at camp. Even if your plan is to just have quiet time at home, it’s good to plan on doing it and then, when the time comes, do it. Otherwise, if you have other kids at home who aren’t attending camp this year, this gives you individual time to spend just on them. While some parents like to do vacations during their kid’s camp stay, other people are a little more glued to their daily schedules. But even if you must stick to your typical routine throughout your kid’s camp session, it’s still important to find some things to do like see friends, go catch a movie at the theater, or finally get to a project you’ve been putting off. None of this will keep your mind OFF of your kid, of course, but it will help you to stay busy and think positively. Also, it’s important to take some time that’s just to yourself. Do the things that you want to do and take this time to relax for cryin’ out loud! Quiet times like these aren’t a dime a dozen—they only come around every so often and you should make a note to appreciate them! Take this time to decompress, kick back, catch up on reading, take a bath, go for a walk. Some parents feel guilty about having a good time while their kid’s away. But th is isn’t logical. It’s not as though your kid out doing something dangerous or unsupervised. Your kid is having a great time at summer camp. They’re out enjoying themselves; there’s no reason you shouldn’t enjoy yourself as well. Enjoy the time you have with your kid being away and enjoy the time even more when they come back! This concludes my Tips and Advice Blog series about easing the separation during your kid’s camp stay. Hope you got a lot out of it. And, as always, thanks for reading.